Some like plastic handles, we prefer metal. Robust, with a nice soft touch, this multifunction knife features all the essential tools with a mini price. 2CR13 Stainless steel multifunction camping knife, aluminium handle with rubberized finish. Heavy duty stainless steel parts. 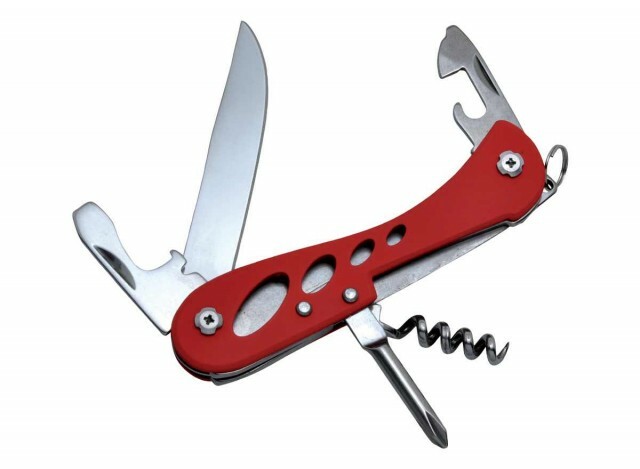 7 functions available: knife , bottle opener, can opener, 5 mm and 2 mm flat head screwdriver, corkscrew, ring. Supplied in carton box. Blade lenght : 7 cm.